Item # 292556 Stash Points: 2,199 (?) This is the number of points you get in The Zumiez Stash for purchasing this item. Stash points are redeemable for exclusive rewards only available to Zumiez Stash members. To redeem your points check out the rewards catalog on thestash.zumiez.com. The Phantom Camo clip belt from Arcade offers a comfortable construction designed to keep up with your active lifestyle. This woven design has a slightly elastic fit and fits up to a size 40" waist. It's finished with an updated capture buckle for a secure fit. 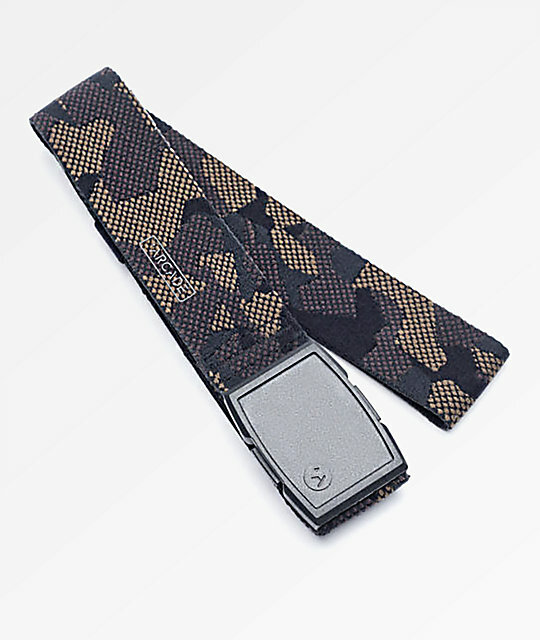 Phantom Camo Clip Belt from Arcade. Printed logo graphic on the belt. One size fits most, up to 40" (101.6cm).